Weeknight quick: Chicken with Vinegar Dry-Fried Chicken 'Tai-Bai Chicken Dry-Fried Green Beans both of the Dan-Dan noodle recipes I make the Dry-Fried and Tai-Bai chicken recipes so often that I now keep Costco skinless/boneless chicken thighs in the freezer. The preserved vegetables make this very sour. It's also quite spicy. I didn't really care for this. I think I dislike the flavor of the ya cai which tends to dominate the other flavors but it did tend to mellow over time. I didn't find this to be as spicy as I was afraid of based on the ingredients. One of my favorite recipes of all time. I could happily eat these every week. Dunlop changed this recipe fairly radically in her later cookbook "Every Grain of Rice." I prefer this version, which is much lighter, to the revised version. I think this is the first recipe I've tried from LoP that I actually found a bit too spicy! Which surprised me as I really love spicy food. I did include the full 1t of Sichuan peppercorns, but I think what really got to me was all the chile oil. Spiciness aside, these noodles are delicious. I had the leftovers the next day and found that the flavor had toned down slightly, and I really enjoyed them then. I will definitely try this recipe again, decreasing the chile oil slightly. This makes for an EXTREMELY speedy weeknight dinner as there is basically no chopping. Pretty tasty, but not my favorite Dunlop noodle recipe. I didn't enjoy the large amounts of soft tofu against the already-soft noodles. Also, I thought the flavor of the sauce was a bit one-dimensional; although, to be fair, I did have to substitute tahini for the sesame paste which might make a difference. Not one I'd repeat when I could make the dan dan noodles from this book instead. I made the filling using the pot sticker dough recipe and method. These were very good. Great way to use up extra pumpkin puree as well. The filling is very good. The dough is very sticky and stuck to the bottom of the steamer basket. This lead to a number of the dumplings falling apart. I'd consider placing parchment under each one in the future. The ginger and scallion soaking water gives the dumplings a nice but subdued ginger and scallion flavor without compromising the texture of the dumpling. Making the dough isn't too difficult but rolling it out does take some time. The biggest problem I had was that the dumplings tended to stick to the pan while cooking them even when using a lot of oil (more oil did help, however). I eventually had to use a fish spatula to pry them out. I poached a chicken breast for the Odd-Flavor Chicken using this method, and while the resulting broth was flavorful (I kept it and used it in the Bear's Paw Tofu), I didn't find that the aromatics added much flavor to the chicken. This could be because the breast poached for a much shorter time than a whole chicken would have. At any rate, the resulting breast meat was fairly tender. Delicious. Incredibly spicy. I might decrease the chili oil slightly next time. Very good, although a little salty. But I might have put too much chili paste. Overall good flavor. Chinese sesame paste is not the same thing as tahini. I found it and was able to make this dish with remains of a rotisserie chicken. Instead of serving over a mound of sliced scallions (as suggested) I made a bed of shredded Napa cabbage, sliced Persian cucumbers, shredded carrot, sliced scallions and bean sprouts. The salad was sprinkled with a light rice vinegar. The sauce was a tad thick so I thinned it a bit with a bit more of the liquid sauce ingredients. Next time I'll use a bit less of the sesame paste (which reminds me a bit of peanut butter). This was very good. The sesame flavor is strong - so not for those who dislike sesame oil. This was absolutely delicious! We had one large chicken breast (a little less than half a pound) hanging out in the freezer, so I poached it per Dunlop's instructions and dressed it with a half-recipe of this sauce. The only substitution made was to use tahini in place of the sesame paste. I think next time I would add even more scallion slivers--they are a nice crunchy break from the chicken. I loved the numbing sensation from the Sichuan peppercorns, which I think really came through since they are left raw here. As mentioned in the other comment, the dressing is quite thick, but we didn't find that to be a problem once it was tossed with the chicken. This is a fantastic recipe and I would make it again in a heartbeat. The spiced soy sauce gives this a very interesting flavour. These little peppers are a great mix of sweet and sour. I've never bothered with peeling them. I have a hard time stopping myself from snacking on them once they're done. We substituted a bunch of red radishes for the daikon, and used the second dressing variation. These were delicious! I love how the chile oil gives the dressing a slow burn. This time we served the radishes with the Boiled Beef in Fiery Broth from this book; I didn't really love having two ultra-spicy dishes paired together. Next time I make this simple salad I'd serve it with a milder main course. Have tried with oven baked tofu instead of fried beef, omitting marinade. Beef is richer, baked tofu is healthier. Both good. I loved this salad, something different for the bumper crop of cucumbers. I reduced the chilies, as I do with all of Miss Dunlop's recipes. This was more interesting than good. My main issue was that the cucumber became very salty. The cucumbers were extremely crunchy and the spiciness is very subtle. Need to salt the cucumbers for half an hour or more. Like amraub said simple and good. Even after rinsing the cucumbers they remained incredibly salty, and I'm not sure why as we didn't have this problem with the cucumber salad from Land of Fish and Rice. Maybe more salt is used here, or maybe it has to do with the cut of the cucumber slices? At any rate, I didn't think this salad was nearly as good as the one from LoFaR. I don't think the quick pan-searing step did anything other than make the cucumbers unnecessarily hot. This was very salty the first time I made it, which may have been caused by the particular condiment brands I used. I have since made it twice, reducing the sweet bean paste and rinsing the beans really well - much better! It makes a good last minute dish if you cook, cool and slice the pork in advance. Once that is done it comes together quickly. Fragrant with a slightly soft texture. Pg. 196 This also comes together fairly quickly and was very flavourful. My first attempt at the fish fragrant method and I quite liked it. I doubled for 4 people to be served along with rice and a vegetable side. Excellent and quick. Made without the bamboo. This was really good. It has a well-balanced sour flavor. I used sambal olek instead of pickled chile paste which seemed to work fine. I cut back on it for fear of too much heat but didn't need to. I omitted the cloud ear mushrooms as I don't care for them. The bamboo shoots added bulk but not much else to the recipe. This is one of my favorites from the book. I use Sichuan pickled chilis (https://www.posharpstore.com/en/paocaifang-sichuan-pickled-chili-peppers-33-lbs) and add slivered water chestnuts, bamboo and celery. It's wonderful! Yum. Ultra-flavorful and fast to throw together. Per the recipe headnotes, I substituted chili bean paste for the pickled chili paste. I also threw in some chopped pickled chilis since I had a jar. The result was ultra-spicy, just what I was going for. I liked the bamboo in this dish, but I think I'd enjoy it equally well with celery, too. Very odd texture but we enjoyed it. We used a 2 3/4 pound pork loin from the local butcher so tripled the recipe. I made several mistakes following the recipe, but it was very forgiving. This meal was very tasty. Everything, especially cooking, took a lot longer because meat had to be cooked in batches. It took about 3 hours from start to finish. This would be very good with chicken in place of the pork. We love mustard tuber, but we thought the dish was a bit bland overall - yet nice. A mild, homey dish. Pg. 213 I was a bit worried about this one as I found the preserved mustard quite pungent. I ended up doubling the recipe to feed 3 hungry fellows with just some rice on the side, but I only went with about 3/4 of cup of mustard tuber despite the doubling. I also upped the soy in the sauce by about 50%. The end result was very tasty indeed. The mustard gives it a very nice umami flavour along with an nice crunchy texture, and the pork was an excellent compliment. On the whole a very easy and a very tasty dish. I might add a bit of chopped bock choy in the future as the green onion was nice but to my taste it was missing a touch of green. I substituted scallions for the yellow chives, and otherwise followed the recipe as written. Delicious! This dish was super flavorful without being spicy, which can be a nice change of pace as Sichuan food goes. I love anything involving black vinegar, but the flavor really came through here. Thursday, 12 May 2011 Ants climbing trees, as we call it, is one of our favorite Szechuan dishes, bean thread noodles (the trees) with a savory ground pork dressing (the ants). This time we used cellophane noodles made from sweet potatoes instead of beans; the texture was exactly the same, and the color was an alluring pale violet. A dead easy dish that might find a place in any cook's repertoire, Fuchsia's version is absolutely true and correct. Great dish. We always have these ingredients on hand, which makes it one of our go-to's for an easy dinner. This is also good with TVP, moistened with broth and shaoxing wine, instead of the meat. This was fairly good, but I had high expectations that weren't quite met. I tried to follow the instructions to a T, but there are some things I would do differently next time to get a better result. First, I actually think I under-salted this dish. I added salt to the celery as it cooked and to the beef, but not to the broth itself--I thought it would be well-seasoned from the dark soy and chili bean paste. In hindsight, I think extra salt in the broth would have really amped up the whole dish's flavor. Second, I think it's key here to simmer the beef until only JUST cooked through. That's what Dunlop says, too, but she also says to return the beef to a boil, which in my case resulted in beef that was cooked a bit too long. I want the slices to be almost medium-rare next time. Finally, I didn't get my oil quite hot enough before doing the final drizzle, so I didn't get the fizzing sound effect! Not the end of the world, but next time I'll really let the oil get smoking hot. Excellent. This dry-frying technique is new to me, and I don't think I waited quite long enough for the beef to get super crispy, but we were still very pleased with the result. We both love the flavor of chili bean paste so I used the full 3T, but omitted the optional chili oil. We also really enjoyed the celery; the addition of a vegetable makes this a very nice one-dish meal for a weeknight. I really enjoyed the recipe and enjoyed the way the beef came out using the dry frying method. I was not really sure if I was cooking it long enough. I made the dish with a pixian broad bean paste which is quite salty: http://www.amazon.com/gp/product/B00BRQ0YC0/ref=pd_lpo_sbs_dp_ss_1?pf_rd_p=1944687742&pf_rd_s=lpo-top-stripe-1&pf_rd_t=201&pf_rd_i=B00A9OF6NS&pf_rd_m=ATVPDKIKX0DER&pf_rd_r=1238GTBDG43CQ3178NCK I would caution against using two to three tablespoons as the recipe calls for or it will be too salty. I would like to find a broad bean chili paste that is authentic but not so salty. Fuschia Dunlop indicates that the Lee Kum Kee brand is not really good for authentic sichuan flavor. The predominant flavor is that of the chili bean paste but not so much that it's overwhelming. The technique in this dish is quite different. Dry fried led me to believe there would be very little oil, when in fact there was a bit more than the average stir fry. The dry fry refers to the process of cooking the beef till all moisture has cooked off, you are then essentially frying the meat on high heat in the oil. This took closer to 15 minutes for me to achieve, but the result was crisped beef slivers. The seasoning works very well, and the celery is an attractive and tasty addition, both in terms of texture and flavour. recipe was not clear about whether to cook beef with marinade or not. I did and it was a mistake. beef texture was sloppy and no rice crust formed as there was too much liquid in the dish. Won't make again. I agree with the below comment; recipe should be more clear on whether to cook with the marinade. I drained mine before mixing the beef with the ground rice, and since there was still a lot of thick marinade clinging to the meat, I also used less than 1/4c water to mix everything together. I really enjoyed making the rice meal--I found it so fascinating to toast the grains and watch them brown, and I used my mortar and pestle to pound them down. However, I'm not sure I'm sold on the final flavor of this dish. I found myself thinking something was missing, flavor-wise. Maybe salt? I reread the recipe and it doesn't seem that Dunlop calls for salt anywhere, which could have really helped here, as I found the dish had an almost muddy flavor. That being said, I did love how the long-steaming technique produced such tender beef--the pieces practically fall apart! I'm glad I tried this, at least. I pressure cooked the beef for 50 minutes at 15 psi in the liquid instead of slowly braising. The beef didn't really seem to marry well with the braising liquid. The braising liquid itself was quite good, the flavor of the beef seemed to clash with it. I've made this with both chicken and pre-fried tofu. When using tofu, I add some of the marinade ingredients to the wok instead of actually marinating. It is not very spicy unless you bite into a chile, which is very much so. Really delicious! I will be making this again. I love this version of kung pao chicken. I've made it many times using both breasts and thighs and every time it's a huge hit. It is a little heavy on the peanuts, but I love peanuts so that's not a problem! Very good rendition of Kung Pao chicken. While I like peanuts I did cut back on the suggested amount by about half as I thought it would be too much. As I served it I thought the amount of peanuts was just right. While the dish is spicy, it wasn't unreasonably so, especially since I removed the chiles from the dish before serving so that no one would have a bite with a chili in it. The acidity is very nicely balanced with sweetness and heat. We really enjoyed this! I loved how the ultra-quick cooking time kept the chicken breasts super tender. This is one dish where I actually didn't mind the white meat (as normally I prefer to cook with thighs). We both thought the sauce was super flavorful. Surprisingly, I didn't find this spicy enough! I may not have let the dried chiles stir-fry long enough before adding the chicken, but I think next time I would just add more sichuan peppercorn, since we love that numbing flavor. I also ground the peppercorns in my mortar and pestle rather than leaving them whole, since I don't love biting into a whole one. I think I decreased the quantity of peanuts a bit as well. This was very quick and easy and great for a weeknight. This was good but be very careful with the chilis; a handful for which the recipe calls made mine very very hot. Maybe it was just the batch of peppers, but will make again with alot less chilis. This was good, less ingredients than some other dishes in this book. Next time I'll try skin-on boneless chicken thighs though, chicken breast is a little too lean for my taste. Still good though. This is a bit different than when I've had this served in a restaurant. The chicken isn't coated in anything before frying. The preparation amps the chicken flavor but the chile flavor was subdued. Absolutely delicious. My only change was to use sambal oelek in place of the pickled chile paste. I did find it a bit wasteful to use a cup and a half of oil to fry the chicken and celery for less than a minute, so I decreased the oil slightly, which didn't hurt anything. The chicken batter didn't stick to the bottom of the pan, so if I make this recipe again I'll try shallow-frying it rather than deep-frying. I was very careful not to overcook the chicken, as Dunlop cautions, and the resulting dish was indeed luscious. The flavor is quite spicy and vinegary, so plenty of white rice is necessary. I think the celery works really well in this dish. Definitely will be made again. Delicious! We used chicken breasts which stayed nice and moist, but I'd still try this with thighs next time. I didn't salt my chicken this time, but would next time. Very nice and flavorful. Great flavors. Used chicken thighs as suggested. I agree with the chicken thighs being the cut to use. Love this dish. Surprisingly not too hot, unless of course you eat the whole chili. This dish will keep nicely in the oven while you prepare other stir fries. This works better with thighs than breasts, but is alright with breasts if the meat isn't cut too small. It really is fragrant and spicy and numbing -very nice. Watch the salt if your chile paste is as salty as mine! This was excellent. Definitely a repeat. Wow. This was so delicious, I think it set a new bar for me as far as recipes from this book go. Although this dish takes a bit longer to cook than a standard stirfry, the flavor is so much more luscious that I can hardly complain. I also think you could easily double the recipe and still cook it in one skillet, since most of the cooking is just simmering time (rather than stir-frying over high heat). The only change I made was to grind up my Sichuan peppercorns, rather than throw them in whole. Otherwise, I followed the recipe as written and we were totally wowed by the result. Make this one. I've made this with chicken breast and/or thigh instead of chicken livers. I use more meat and adjust the sauce ingredients and pickled ginger to balance out the increased meat amount, though I don't increase the celery. It's still a very tasty dish made this way instead of with the livers. I've served it to friends this way, and it's always received well. They're usually surprised that they like the celery. I think de-stringing it as Dunlop says to do is important. Very tasty. I used cod filets rather than a whole fish, so the deep-frying step didn't apply (not that that stopped me from trying anyway and make a big mess). I used homemade fish stock as the stock base which made this even more delicious. I liked the idea in the headnote of braising some tofu in the sauce to eat as a second course, so I saved the leftover sauce to eat with some tofu or leftover meat on another day. I agree. This dish is fabulous with shrimp. I've also used scallops. I don't deep fry often, but when I do this dish is at the top of my deep fry list. Sauce is fabulous and great on other things. These were delicious, with a good balance of salty from the Tianjin Preserved Vegetables, and heat from the chilies. I would suggest you go a little lighter on the preserved vegetable as it is quite potent, but otherwise the recipe is excellent as written. I love this, especially with yard long beans. It's a great way to make a little meat go a long way. This is a very versatile way to cook greens. She mentions several substitutions in the book. I had some extra asparagus so I decided to roast it and then finish it using this method. It's not traditionally Chinese, but it worked very well. I'm not sure what went wrong for us, but neither of us found this dish to have much flavor at all. Considering the amount of dried chiles and peppercorns used, as well as all the ginger and garlic, this shouldn't have been the case. I don't really have an explanation--maybe we didn't let the oil infuse with the aromatics long enough? At any rate, I totally trust Dunlop's recipes and would give this one another try. The result wasn't bad--just bland. Using a mixture of interesting mushrooms is not optional. I used a mixture of button, oyster, nameko, and lobster mushrooms. Just garlic and salt was enough to bring out the flavors without drowning them. I tried this technique with chinese lettuce (Ong Choi) and it worked quite well. I did however have to add a bit of stock and put the lid on the greens to get them to cook through in the alloted time. Great with sweet dishes like hot-and-numbing dried beef. We tried this recipe tonight using the broccoli variation--broccoli is cut into florets, blanched, and then stir-fried in the same way as the potato slivers. This made a good side dish as it was less spicy than everything else we served, but overall was not extremely flavorful. I think this dish really relies on a good salting and a generous pour of sesame oil. I would like to try this with potato as I suspect the thin potato slivers would allow for better distribution of the salt, oil and spices. I love this dish. It's my go-to way for preparing fresh corn. It's simplicity in seasonings means it goes well with just about anything regardless of cuisine. I use just enough bell pepper to give some color but not enough to dominate the dish. It's hard to know how to rate this. It's a very simple dish. A bit too simple for my taste. But if you just want an alternative to boiled or steamed corn, this is it. I make this a lot in the summer, it's a delicious way to use zucchini, and the simple ingredient list means it can accompany any type of food, not just Chinese. Take your time to cut it thin and with care because it's really all about the texture. This is my go to zucchini side dish for all kinds of meals. Very simple flavours make it versatile and refreshing. The worst part is cutting the zucchini. But it's quick if you have a beriner-type slicer. Simple and delicious recipe for my over-abundant supply of zucchini from the garden. Yum! So simple but so good. Agree with the other comments that you could serve this as a side dish for many types of food, not just Chinese food. We were both surprised by how flavorful it was considering the minimal ingredients. This is really good with super fresh tomatoes. Unlike my mom's that has the tomatoes cooked down to a sauce, here, the tomatoes are sliced thin and barely cook, so they keep their integrity and you can taste the freshness of the tomatoes. This will be my go to with tomatoes from the garden, will revert back to my mom's with less than stellar tomatoes. One of my favorite dishes, but you have to plan a few days ahead if you're going to pickle your own beans. If you do it without the pork (and without a meat substitute), I'd leave off the soy sauce. I've been wanting to try this dish for so long, and wow, it didn't disappoint. Even with having to factor in pickling time, it's such a simple dish to throw together, very weeknight-friendly (as long as you have planned ahead, of course). I only brined my green beans for one day and they were very flavorful and provided plenty of salt to the final dish (although I did add a few pinches of salt to my ground pork mixture as instructed). I will make this again. Pg. 308 This was easy to put together and fairly tasty. I did cut back the oil a touch and I also went with cherry tomatoes because that is what I had. Lastly, skipped the lotus and just replaced it with carrot. Quick and easy prep. Wow, talk about indexing gone wrong. The EYB ingredients list pork bones, chicken pieces and scallions, all ingredients for the 3/4 cup of chicken stock used. Anyway, this is just a simple stir-fry of the silk gourd with slices of ginger, and the stock added at the end, braising the mixture for a few minutes. Very simple recipe to showcase my fresh home-grown silk gourd. Absolutely delicious even though it is quite different from most other ma-po tofu recipes. Most recipes use ground pork and do not include fermented black bean. My block of tofu was 20 oz, so I increased everything a little bit according. I used ground pork and leek and did not use the optional Szechuan chili powder. The recipe calls for 4 baby leeks or 2 leeks, I have never seen baby leeks anywhere so I just bought regular leeks. I sliced one leek and got over two cups, so I stopped at that. I stir-fried the leeks by themselves for a bit to soften them first and added them back at the end as directed. FD was right to tell you to add the slurry in two goes, I only needed about half of the slurry made. Delicious. I cut the recipe in half and it made two decent servings with rice. I used about half the amount of optional ground chiles. I used extra firm tofu. Pg. 313 This was excellent. I have often seen this on menu's but have not ordered since I am not always partial to tofu. I thought I would give this a try as a I had read good reviews of Dunlop's version. I went a 1.5 X batch as I had more tofu than required and it probably served 4-5 good sized portions along with rice and a vegetable side. I used the beef as suggested and it was great, but pork would likely be very good as well. The best part of the dish is the complex layer of flavours that is very savoury, a little umami, without any sweetness. I usually like the balance of sour, sweet, salty, and bitter that you find in many chinese dishes, this one was missing a few of those notes which made it very different, but all the better for it. The savoury nature of this dish is excellent with the chilli bean paste and the black beans adding a lot of complexity. I found that it did need the ground chillies but next time I'll use chilli oil for its even heat. Delicious! Ma po tofu is one of my favorite dishes, period, so I was very excited to try this version. I used 1.5t of the optional Szechuan chili powder (although I used red pepper flakes which I believe is the substitute she provides) and this was SPICY, just the way we like it. I could probably go all the way up to 2t next time. We did not have baby leeks and so used regular ones, but I'm sort of unsure if that's what we were meant to use--in the instructions, Dunlop says "baby leeks or scallions," and I think scallions would have made more sense in this dish. The leeks, sliced as instructed into 1/2" rounds, were obviously still quite large. With scallions (and, presumably, baby leeks), you wouldn't have that issue. I chopped the leeks down further so that we would not have to eat huge rings of them at a time, but next time would probably go with my gut and use a handful of scallions cut into rounds. Other than that, this recipe is perfect. We had this tonight following the Bear's Paw variation and loved it. I used normal bacon rather than lean as that was what I had on hand, and I know the bacon is listed as optional, but it added a really nice layer of flavor and now I'm not sure I'd want this dish without it. As per usual, I was too impatient as I pan-fried my tofu slices, and so some of them ended getting torn up because I tried to pry them out of the pan too soon. I had leftover poaching broth saved from the Bang Bang chicken and used that as the stock for this dish, which I think also added a nice flavor boost. I had to substitute a little ground ginger for the fresh as I realized mid-cooking that I'd run out of fresh, but I don't think the dish suffered. I let the broth reduce down by about half before adding in the cornstarch, so there was still a decent amount of sauce left but it was fairly thick. This was delicious and I would make it again in a heartbeat. It was just the right amount of spicy. I made the bear's paw version (pan-frying the bean curd instead of deep frying), my box of tofu was 20 oz and I used about 3 oz of Chinese bacon, I kept everything else the same as specified in the recipe and it was delicious. There was a bit of kick but not very spicy. Will be making this again. I think it would still be good without the bacon which is optional. Very nice. Not quite as delicious as the fish-fragrant pork slivers, but still tasty. I substituted some chopped pickled chilis for half of the pickled chili paste, and the result was extremely spicy. Next time I might decrease the pickled chilis slightly, since the flavor on this dish didn't seem quite as well-rounded as on the pork dish. p. 329 Pork bones? My book doesn't use pork bones for this recipe. This is possibly the best Hot-and-Sour Soup recipe I have ever tried. It is very forgiving. Every time I make it I use a different mix of vegetables, meat or no meat, We frequently have this for a main course. Sometimes, I'll make a small batch for lunch. Be careful not to burn the ginger, and don't add too many vegetables. I sometimes add a tablespoon of dark brown sugar to the full recipe. It adds another dimension of complexity. I made the variation with the pork balls and it was delicious. I started by enriching regular chicken stock with some goji berries, red dates, green onion, ginger, and a few chicken bones. Once that had simmered for about 45 minutes, I strained it, seasoned with salt and white pepper, and then added the pork meatballs, for which I followed the directions precisely. I was concerned the meatballs had been overworked, but the texture was silky smooth and the flavour was very nice. They complimented the broth very nicely, especially when I added a few bok choy leaves to the soup, and then garnished with green onion. Report by Melissa Block from Chengdu includes preparing this dish. The Chinese call the province of Sichuan in southwest China the land of plenty and the place for flavor. Although it is mostly known in the West for its hot-and-spicy dishes, the Chinese love Sichuan food for its inventive use of seasonings and its many styles of preparation. 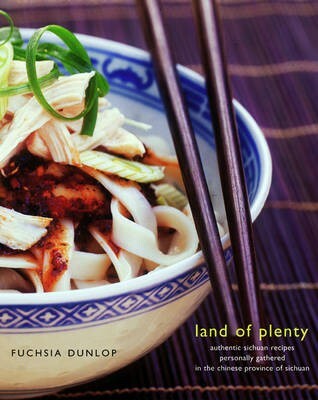 Fuchsia Dunlop immersed herself in Sichuanese cooking and culture for two years, gathering from regional chefs and home cooks a full range of recipes from soups to desserts. She provides glossaries of Sichuan's ingredients and cooking methods, and Chinese characters for and definitions of twenty-three flavors at the heart of the Sichuanese culinary canon. Equally valuable for novices and experts, Land of Plenty teaches everything from how to wield a cleaver to how to make delicious Kung Pao chicken, offering a unique user-friendly introduction to one of China's richest cuisines.